Present state: Demolished - no evidence of the station remains. 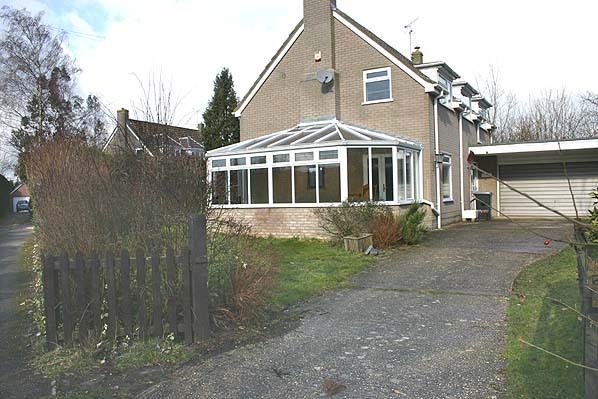 Four house have been built on the site of the station and goods yard. Notes: The station was opened as West Shefford and was renamed Great Shefford in November 1900. The original platform was 9" in height but in 1908 the station was partially rebuilt with a standard height platform and with the original wooden LVR building being extended with a standard GWR pagoda shelter being provided. Like all of the intermediate stations on the Lambourn branch the platform was topped with cinders and fine gravel while it's leading edge was built of sleepers. Rails sunk vertically into the ground supported the entire structure throughout its length. Great Shefford was the busiest intermediate station on the line and because of this the original configuration of a single loop siding was enhanced by the GWR in 1910 as part of the line's general upgrading process. An 80 ft horse loading dock was constructed with rail access from the Lambourn end by means of a scissors crossover and an additional dead end siding was installed to serve this newly built dock. There was a wide range of agricultural freight traffic including milk. hey and corn were dealt with in large quantities. The station also dealt with sheep, cattle and occasionally horses being transported to race meetings. The station also had a coal yard. In 1923, to facilitate the handling of larger, heavier loads, a 64 ton capacity crane was installed in the station yard; this was mainly used for dealing with timber. The GWR provided a 12 ton capacity weighbridge at the rear of the horse loading dock. The railway came late to the isolated Berkshire town of Lambourn. The first scheme for a line to the town was put forward in 1873 with a proposal to build a tramway from Lambourn to Newbury but the scheme foundered through lack of money. In 1881 the proposal was revived when a Bill was put before parliament for a light railway. Despite being passed by the Commons the Bill was rejected by the Lords after some local protests. On 2.8.1883 a new Bill was introduced and passed authorizing the Lambourn Valley Railway to build its line. Lack of finance delayed the construction of the line and by July 1889 only the first 4 ½ miles was ready for track laying. By June 1890 9 miles of permanent way and been laid but the contractor was unable to complete the line and further work was halted. At the end of 1893 a further Bill was obtained giving the LVR a further 4 years to complete the line but work didn't restart until January 1897 and the line was not ready until the spring of 1898 with a private opening on 2nd April. The line was operated and maintained by the GWR under an Act of 1895 with 5 daily trains and an additional late evening train on Sunday. The line was initially single track throughout with no signaling and only one engine in steam. Station platforms were all nine inches high and with the exception of Welford Park, sited on the west side of the line. In January 1904 the GWR expressed an interest in buying the line and a year later the LVR board approved and amalgamation which took place on 2nd July that year. 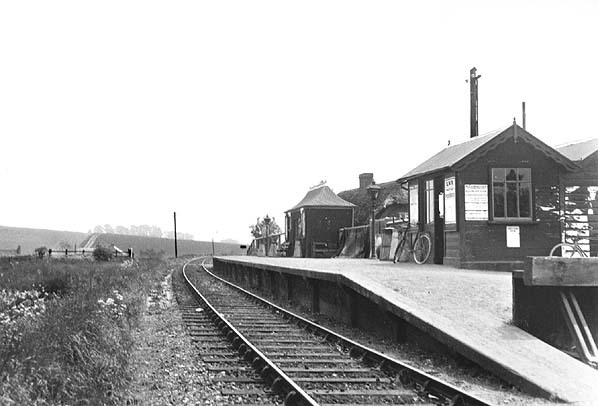 Plans were immediately drawn up to improve the line; these included a new halt at Newbury West Fields which opened in 1907 and the rebuilding of Lambourn Station with new buildings and a standard height platform. Eventually all the platforms on the branch were replaced; most stations were provided with a siding and passing loops were added at Boxford, Welford Park, Great Shefford and East Garston. The branch was worked by steam railmotors and locomotive hauled trains. By the mid 1930's, passenger numbers were dropping due to competition from local bus services and in an attempt to win back passengers and save costs and experimental diesel railcar was tried out on the line in late 1936. This proved successful and a rail car was specifically built for use on the branch and once again the line began to make a small profit. By nationalisation in 1946 the railway was in good order with a well used and reliable service. New traffic was brought to the line in the early 1950's, when a three mile branch was built from Welford Park to the American air base at RAF Welford. It was hoped that this would ensure the survival of both passenger and freight traffic but in 1959 British Railways announce closure of the line to passenger traffic and this took place on 4.1.1960. Other web sites: The Lambourn Valley Railway 1898 - 1973. Excellent web site with a large number of archive photographs of all the stations on the branch and pictures of the branch to RAF Welford.. 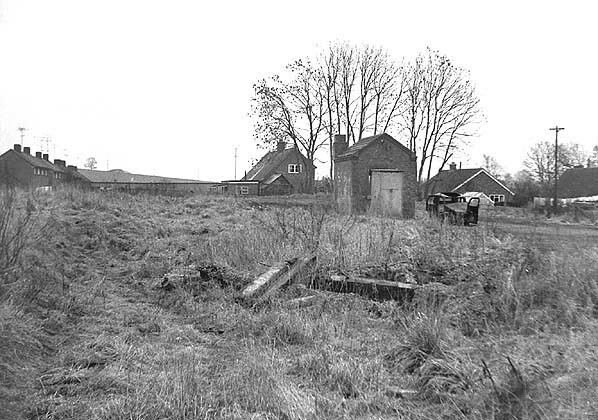 The site of Great Shefford Station in February 1969. Only the weighbridge buikding survived.